Islands are wonderful places to dream about – sandy beaches, sunny days, warm breezes. Wouldn’t it be wonderful to head out one day and discover an island? 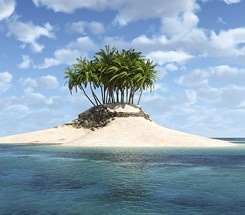 With a little luck, some imagination and a lot of determination, you might be able to find your own island. Fist it’s important to know what to look for when searching for an island. By geographic definition, an island is a piece of land completely surrounded by water. Use a map to show your child the difference between an island and a peninsula. On the map, locate the state of Florida. Florida is a peninsula (not completely surrounded by water) while there are a number of small land masses to the south of Florida (the Keys) that are islands. Does an island float in the water? No, unlike an iceberg, an island does not float. An island is almost completely made from rock. An island is part of a land mass that rises above water. How can you get to an island? Younger kids may wonder how it’s possible to travel to an island. If the island is large enough, it may host an airport so visitors can fly to the island. Large ships and boats can easily transport people to the island. And if an island is close enough to another land mass, there may be a road that leads to the island. Greenland – Most kids will recognize this island as it’s the largest in the world and can be found between North America and Europe. Some may think that Greenland is just an island of ice but there are many people who live here and call this island home. 1,000 Islands – Located in Lake Ontario and the St. Lawrence River between Canada and the United States is a large group of islands. The Thousand Islands is actually an archipelago of more than 1800 islands. Archipelago is the name for a cluster or group of islands. Galapagos – One of the most famous islands for scientific studies is the Galapagos Islands. The Galapagos Islands are also an archipelago. Darwin’s theory of evolution resulted from visits to this island chain as many of the animals and plants on this island are not found anywhere else in the world. Hawaii – One of the 50 United States, Hawaii is a group of volcanic islands located in the Pacific. Most kids will recognize the name of this island chain (and I’m sure many parents would love to visit). Now that you know more about islands, why not head out and try to discover one of your own. Since we know that an island needs to be surrounded by water, begin by finding a lake or large river in your area. Scout out different areas in this body of water to see if any islands exist. Are there any large islands? Did you find an archipelago? Do you think others know of the island? Most states and countries also have islands as part of their landscape. If you live close to an island, take a trip to visit. Can you get to the island by car or do you have to take a boat? Think about how difficult it would be to live on an island all year round and some of the travel restrictions you may face. And if you aren’t able to discover your own island, grab a book and take an imaginary trip to visit one. Try The Little Island by Margaret Wise Brown, a nice picture book that introduces islands to young readers. Older kids will enjoy one of these chapter books which tell adventurous island tales: Abel’s Island, Nim’s Island, Treasure Island and Island of the Blue Dolphins.